What a great event! After a 4.5 hour drive up to the championships on Thursday, I went right to work touching bases with race management and all of our drivers. I didn’t get to race this year, but that allowed me to fully focus on the success of our class at the event. As acting Series Director, I saw it as my job to both help the drivers comply with the rules and ensure that everything concerning the class and its rules went smoothly. Also, as a daily professional mechanic and the world’s biggest fan of the 944 Spec class, I saw it as my duty to keep as many cars running and on the grid as possible. I want to personally thank all the drivers who showed their appreciation of my efforts with their kind words. That really makes up for my not being able to race with you guys! As always, we were supposed to have more drivers in attendance, but life gets in the way of racing. Those that made it were Tony Mazzagotti from the Las Vegas group, JP Molnar from the Arizona group, Ron Dale from the NorCal group, and Tom Atteberry, Marcelo Vine, Jim Richmond, Chuck Sharp, Gerry De Lira, and John Niedernhofer from the SoCal group. Chuck’s wife, Debbie, was also running their 944 in another class and not too far away in the paddock was Joey Genitempo, who was also running his 944 in another class. Missed the 2016 944Spec Championship race? Catch a replay of it on NASA Pro Racing's Livestream channel! Fast foreword to 20 mins to begin the broadcast. Exciting news for 944 enthusiasts in the Southeast! 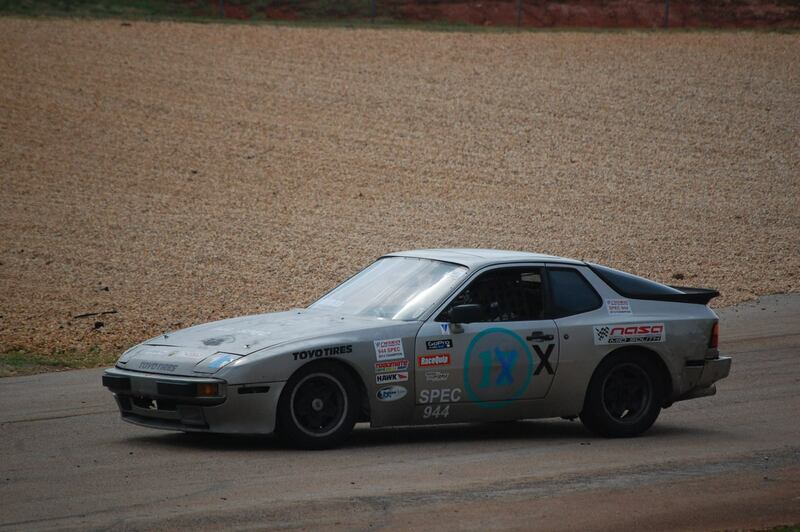 944Fest South will be hosted during the NASA Southeast's June Jam event at the historic Road Atlanta! This event will be a gathering of 944 enthusiasts who will converge on two race tracks located just outside of Atlanta, GA.
944Fest will be a 2 day event which includes a High Performance Driving Event hosted by the NASA Southeast with 944Spec racing as the headliner for the Saturday Afternoon racing action, along with a car show, followed by go-karting, tech sessions and a banquet hosted by Motor Werks Racing at Atlanta Motorsports Park! Details are still shaking out for extra 944Spec contingencies for this event but you can expect a whole set of Toyo Proxes RR race tires and Hawk Performance Brake Pads to be given away to the racers. Click on the pictures below or head to the forum for more details! 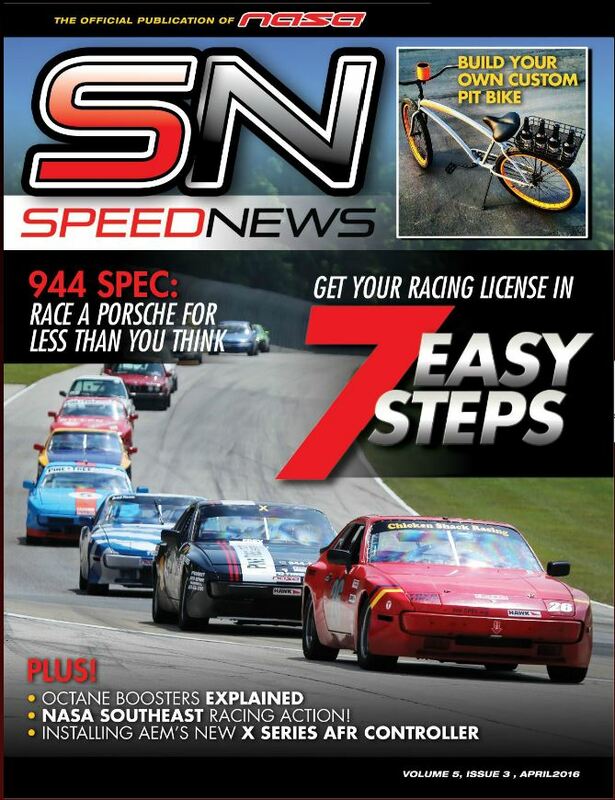 This month's issue of NASA Speed News is a big one for 944Spec! Not only are we featured on the cover, but we also have a class syllabus summarizing what we're all about, a story about the NASA Southeast 944Spec hobby shop called the Chicken Shack, and a member profile about one of our National Champion's from the NASA Rocky Mountain region! There are also race write ups from recent So Cal and Southeast region action. Round 3 of the Southeast Region 944Spec season included the largest field of 944Spec cars ever assembled for a Southeast Region race at 11. Saturday qualifying saw the regular front runner Jason Stanley as fastest and a Southeast Region veteran of Brian Evans on outside pole, but then the next 4 cars all qualified within a second of each other led by the rookie Kyle Kimball. The start of the race saw the Mid-South Champion Jeremy Pohlman trying an inside pass in the grass around Joel Barber and Pete Yousko for fourth. Cars remained two wide up all the way up the steep hill through Turn 3 where Stanley maintained the lead, followed by the rookie Kimball, and ‘he who gives no quarter’ Barber. B. Evans fell back to 7th after carrying too much speed out of T7 and losing momentum running down that long Road Atlanta back stretch. At the start of lap 2, Kimball fell back to sixth after getting no quarter from Barber who executed inside pass in Turn 1. Kimball ran wide on the exit as a result taking the safe way out. With Yousko now in third, he worked an excelled launch off T7 to use a drafting pass into second past Barber finishing it off with a late braking maneuver down the inside of T10a. Atteberry, Hicks and Fonseca were competing in their second consecutive Western States Championship event, Williams coming across the country to get a taste of West Coast racing. Camaraderie was the name of the weekend, as perfect Northern California low-70s weather greeted the racers. The 944 Spec community would be tested right out the gate, when during Thursday's practice Joe Bajo had a freeze plug come loose in his cylinder head. Simon Peck and Jim Hicks lent their brains and wrench-power to get Joe back on track for Friday. Simon Peck emerged a philanthropist, having previous experience at the track, and loaned use of his car for a session as Joe hadn't been to Laguna Seca before.